With Ubidots Organizational tokens, Ubidots Administrator accounts can now create TOKENS and provision devices specifically to a predetermined organization; now bypassing having to assign each device to an Organization within your application's architecture. 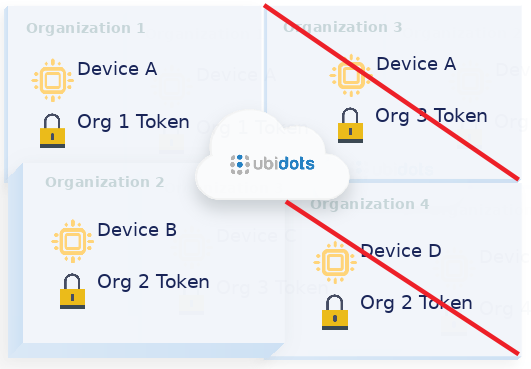 Bit of background, to keep Organizations and Devices separate and organized correctly, Ubidots uses a two-tier device identifier model – TOKENS and Device Labels. First, the Ubidots TOKEN is the key for each piece of hardware to send data to Ubidots; every Ubidots account has a parent TOKEN, or using this tutorial below you can create a subtoken called an Organization TOKEN, the key for each Organization's data within your application's architecture. 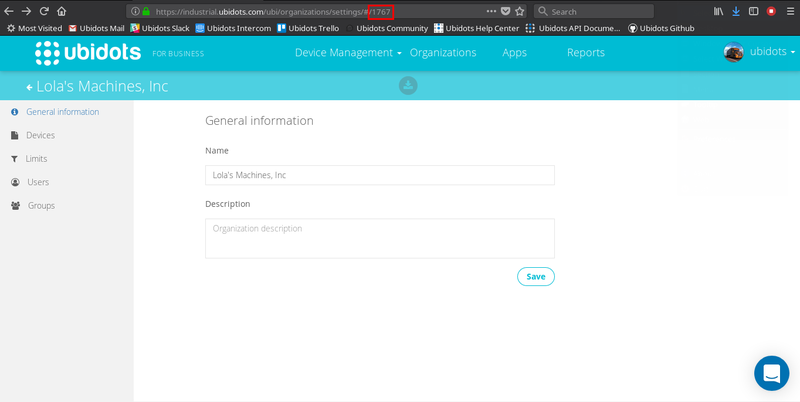 The second tier for Ubidots device identification is Device Labels, which are unique identifiers per device, across a single Ubidots Administrator's account. Using both the TOKEN and Device Label, Ubidots users keep their data associated with the right hardware data in the right places. In the below diagram we can see the quadrants II and IV are incorrect logic and any attempt to send data through these structures will be rejected. In quadrant 3 we see a repeated Device ID, which will be rejected as it has been claimed already. In quadrant 4 we see a rejection because the Org TOKEN does not align with the intended Org 4. To create a TOKEN for an Organization or a subtoken to your parent TOKEN, we must first have an Organization created and know its Organization ID. Now that you know your Organization ID, you will need the Ubidots API Key to create the Organization's TOKEN. To create an Organization TOKEN through the API, make a POST request from your computer's terminal with the structure below assigning credentials along the way, where indicated. TOKEN_NAME == Custom assign a new TOKEN name as you see fit. 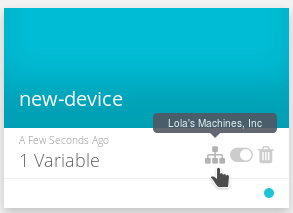 Now that you have the organization TOKEN created, you can manage devices and variables using Ubidots API. 1. The POST request below automatically creates a new device with a variable assigned to the organization of the new TOKEN returned. As you can see in the example request above, we are assigning the device label "new-device" with a variable "humidity" to the organization of the TOKEN returned. Now that we have a successful response from the server. Go to your Device section of your Ubidots application and visualize the device created for the Organization. As you can see above, the device is automatically assigned to the organization of the TOKEN_RETURN. NOTE: If the device label assigned in the request is already created in the Organization, the variable set will update anytime data is sent from that device. 2. As described previously, if both the TOKEN and Device ID are not properly ordered, the POST will be rejected. Using the TOKEN_RETURN we try to update a device that has already been assigned to another Organization by the device ID (Quadrant 3 in the illustration above). As you could conclude, the above the request is rejected because the device ID has already been provisioned to another organization. To access and manage an Organization's Tokens, simply go to the "Tokens" section of the Organization's settings. Now it is your turn to create multi device applications effortlessly and affordably. For more application ideas, check our Ubidots Help Center or always feel free to reach out to Ubidots Support team with any additional questions or thoughts.